What Do Other People Think About Cicis Pizza? We all know Cici’s already makes great pizza. But hey – they want to make it even better and I’m not complaining about that. In order to do so, they’ve launched an official survey where you can leave your feedback so they can improve the experience you have next time you visit. 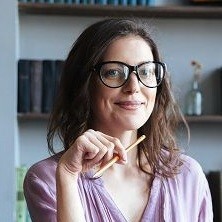 The survey is called CicisVisit and you can find it on cicisvisit.com. 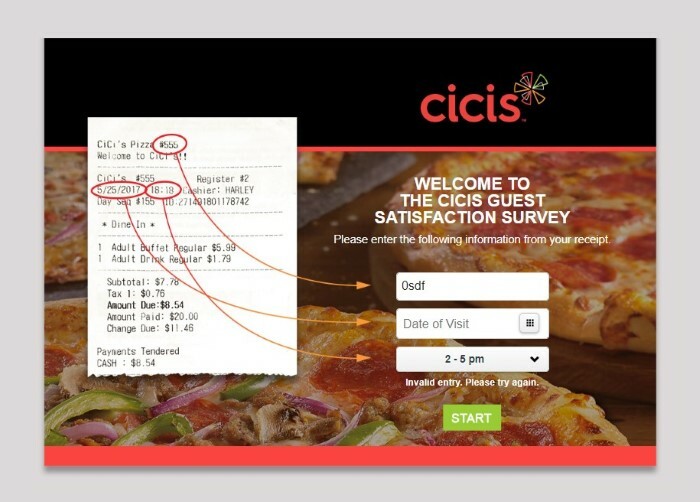 At the end of the survey, there will be a Validation Code presented to you, write this on your receipt and take it with you on your next trip to Cici’s for your free food! 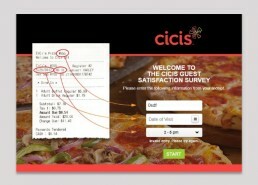 What was your overall satisfaction rating on your trip to Cici’s? How was the quality of their pizza? Did you order any of the sides as well? How likely is it that you’ll recommend them to friends or family in the future? Were the staff friendly and inviting? Were they able to assist you quickly? Do you feel your feedback is taken seriously with their CicisVisit survey? 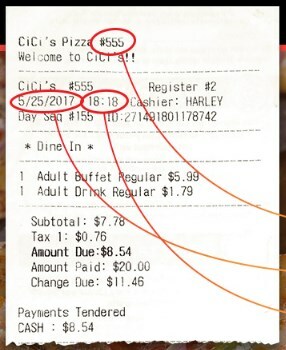 Cicis is an all-American pizza chain based in Texas. Founded in 1985 in Plano, Texas by Joe Croce and Mike Cole. To date, they have around 440 restaurants, some of which are franchised, across 35 states. They offer buffet style food with heaps of pizza, pasta, salad, soup and dessert. That’s a cracking buffet selection if you ask me! They even have wings, in four different flavors (yum), though you do have to pay a little extra for the luxury of adding those to your order. But when a buffet starts at $5.99, you can’t be expected to have it all right?! Huffington Post have even reported it as America’s favorite fast casual pizza chain, and, to be honest, with a buffet that big for a pretty low price it’s not hard to see why! During their first 16 years in business, they managed to expand their presence from their single store in Plano, to 363 restaurants, and, in 2001 they added a bunch of new features to their buffet. By 2005, they were crowned fastest growing pizza chain in America as they opened up their 500th store. In 2010, they made a very bold statement saying they planned to open another 500 stores by 2020. Now, as they’re on less than 500 now, they’re either planning some crazy growth in the next year or so, or that idea completely got sacked! They have an awesome loyalty program! 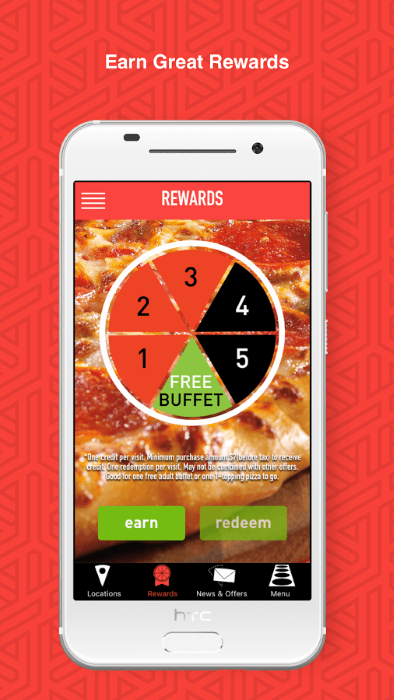 2015 saw the launch of their loyalty program, Mycicis, which they built in association with the platform Punchh. The app is available for free download both on android and IOS and is super simple to use. The general thoughts on working at Cicis is like any other fast food chain, some people love it and others absolutely hate it. Perks include free pizza (sign me up!) and plenty of hours for staff, which can usually be difficult in the hospitality industry. Many staff members have complained of low wages and not having enough people on shift though. The company is fairly good at giving back to the local community. Earlier in the year when the horrific forest fires were terrorizing California, they were offering all firefighters and first responders on the scene free meals as early as 6am which I thought was incredible! Small gestures like that really make a difference. And they’re still doing it! They dish out free buffets too for all veterans on Veteran’s Day. Croce was even reported to have donated 20% of his proceeds from the company to his local church, Gateway, which he was a member of, when he retired back in 2003. They’re definitely a company that knows how to give back. We’ve already been through this. I love a good Pizza buffet but the management at this store is garbage. Not a single pizza slice on the @MyCicis buffet. They don’t close for 90 minutes. I don’t understand how they stay open. Otherwise, you can have a read of their FAQs to see if your question has already been answered. Lastly, feel free to give corporate a call on (972) 745-4200.